UC Riverside overwhelms the Tritons in the second half to take a 75–52 win. After falling to Loyola Marymount University by one point last week, the UCSD men’s basketball team was thwarted again in exhibition, as Division-I opponent UC Riverside defeated the blue and gold by a score of 75–52 this past Saturday at SRC Arena. The loss served as the final preseason game for the Tritons, who will open up their regular season this week. The Riverside Highlanders came out strong, taking an early nine-point lead in the first half. The Tritons, however, would regroup and answer back with six of their own points to keep the game within reach. Despite some point-blank misses around the rim, UCSD was able to hang around in the game with the help of sophomore guard Adam Klie, who scored seven of his total nine points in the first half. He also grabbed a team-high five rebounds on the night. Both teams used their strong defensive performances to keep the score low and close going into intermission, with UC Riverside holding a slight 29–24 edge. UC Riverside would run away with it in the second half however, going on a 21–0 scoring run to blow out the Tritons. A huge alley-oop dunk got the crowd into the game and swung the momentum in favor of the Highlanders. In the seven-minute stretch, UCSD committed four turnovers and missed all eight of their shots. 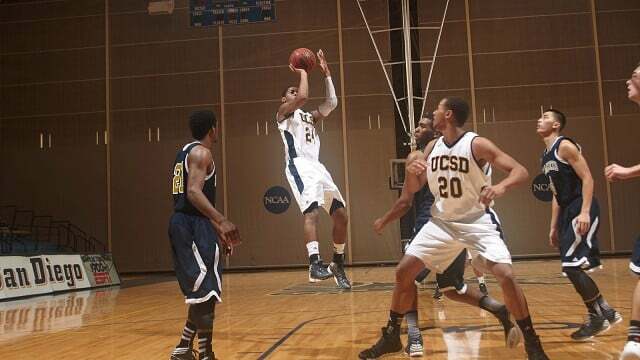 UC Riverside’s pressure defense took away the three-point shot and forced the Tritons to drive the ball to the lane. UCSD had trouble finishing in the paint due to strong rim protection by UC Riverside’s junior forward Taylor Johns, who recorded five blocks in the game. UCSD had an uncharacteristic night from beyond the arc, going 25 percent on only 12 attempted three-pointers, in contrast to the 32 three-point attempts they had against Loyola Marymount last week. UCSD averaged almost 25 three-point attempts per game last year, making this the first time the team has shot 12 or less from downtown since the 2011–12 season. Freshman guard George Buaku got the nod to start the game at the point over fellow freshman forward Jordan Flannery, who started the game at Loyola Marymount. Buaku finished with four points and three of the team’s five assists. Junior forward Treavon Francis was the only Triton to finish in double digits, scoring 10 points in 15 minutes. Junior forward Drew Dyer added seven points and two rebounds in 19 minutes. With the preseason behind them, the Tritons will officially tip off their season on Wednesday, Nov. 19 when they travel to San Francisco to take on Academy of the Art University.